Gone trekking, hiking, camping and paragliding, but the itch for thrill has only worsened over time? If adventure is what you seek then wait no further, dive headlong and book a seat on a skydiving expedition in the Himalayas with Beep. The snowclad mountains, the crisp cool air and the open blue skies call you like no one else, and getting some freak adventure in this setting has been your long saved wish? This braveheart dream can definitely materialise - you simply got to sign up for Beep's annual skydiving expedition. No far off expensive destination to pick or month long wait for travel clearance involved, you can now jump down from the chopper in the Himalayas by just travelling northwards, to Nepal! No photographs can come close to the sun-kissed peaks, the fluffy clouds and the shimmery snow as you float in air 15,000 ft above ground level. 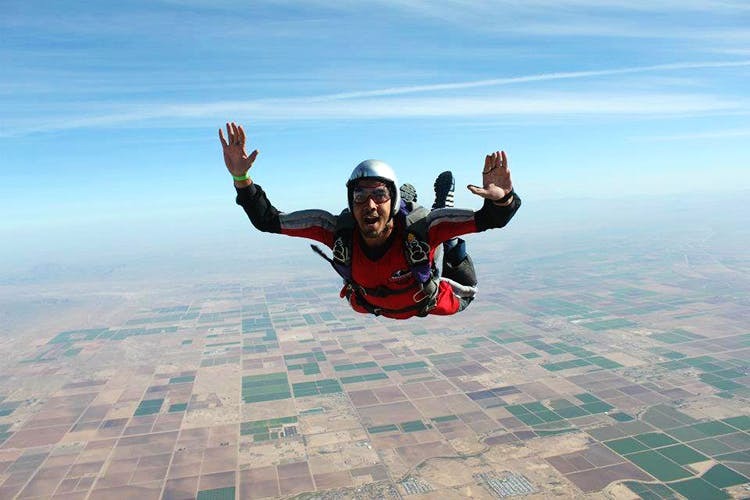 With a team of expert skydiving trainers, state-of-the-art equipment and gears and a scratch set-up team, Beep maintains international safety standards to keep you secure while letting you take the plunge of a lifetime. A week-long programme aims to give you that legendary tandem (harnessed) skydive to the depth of the upper Himalayas, this one is meant for bravehearts and adrenaline junkies. Best of all, you don't have to fear missing out on capturing the majestic views in photos and videos because your gear will come equipped with cameras! The five nights and six days trip of hiking, practice and jumping is priced at INR 85,000 per person. The price is definitely too steep, but the experience makes it totally worth the amount. Registrations for the next expedition is already on now. Beep conducts annual skydiving expeditions in other places of the world too. If your purse strings are not tight, then wait no more and sign up for their skydiving expeditions in Egypt and France.